Fantastic wash mitt for rinseless washing! Plush long fibers pull dirt away from the surface. The non-split microfiber material then releases the dirt into your rinse bucket. Richard over at The Gloss Shop has tested tons of wash mitts, wanting to find one that offered great performance while being economical for the professional detailer. After testing just about every wash mitt in the industry, Richard has found his ideal wash mitt! The Gloss Shop Wash Mitt is ideal to use in any type of wash process however it is fantastic in a rinseless wash setup with Gloss Shop Sublime or your favorite rinseless wash. However you prefer to wash your car, rinseless or two-bucket method, the Gloss Shop Wash Mitt works well! 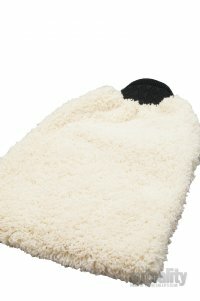 This wash mitt is more plush than other microfiber car wash mitts on the market. The plush fibers pull dust, dirt and grime down the fiber and away from the surface. What really separates this wash mitt is its non-split microfiber material. The non-split nature of this wash mitt allows all the debris collected while washing to easily be rinsed off the wash mitt. That's why it works so well in a rinseless setup. Rinseless washes utilize chemicals that pull dirt into the wash mitt. Because of this, you will find many wash mitts get extremely dirty while rinseless washing and you have a hard time releasing that dirt from them. Those wash mitts utilize split microfiber. While that may be ideal for other processes, they aren't the best for rinseless washing. The Gloss Shop Wash Mitt's non-split microfiber safely and effectively pulls dirt off the surface of your car and then releases it into your rinse bucket. Improving the results and efficiency of your rinseless wash process. If you rinseless wash, you should have the Gloss Shop Wash Mitt!